Have you attended a training session provided by the library? If so we would love to hear what you thought? Did you learn skills that have helped you with your study or research? If you would like to find out more about the training available from the library please visit the training section of the library's website. Aplologies for any inconvenience caused. The AWC Annual Writing Competition is now live. Top Prize: I-Pad 2 and publication in the Sin newspaper. Enter by 21 February 2013. Please be advised that the ARTstor Digital Library will be unavailable from 4 am until 6 pm on Sunday, January 27th until due to essential maintenance. Having trouble finding the books you need? Are you finding it difficult to find the books or journal articles you need amongst the Library's half a million books? Do you need help? The Library offers 'Finding Books and Journals' training sessions every day Monday to Saturday, which will give you the skills you need. Library Training Room, ground floor of the Library. We also have some short online video tutorials and guides, showing you how to find a book and other key library skills. And of course don't forget that library staff are here to help - come to the Customer Services Desk in the Library foyer or email library@nuigalway.ie and we'll do our best to help. The Library System will undergo essential maintenance from Thursday 24th of January at 23:00 hours, until January 25th at 20:30 hours. It will still be possible to borrow and return books at the library issue desk via our offline Circulation facility. However, a range of library services will be impacted. While the library catalog will be available, real-time information regarding item loan-status will not be available. The placing of hold requests and group-study room bookings will not be possible. It will not be possible to pay library fines. Users will not be able to place Interlibrary Loan requests (ILL). As our Acquisitions, Cataloguing and ILL modules will also be unavailable we will not be able to provide any information on budgets or order status. In addition, no ordering, invoice payment, cataloguing or ILL processing will be possible. Due to essential maintenance on the publishers' site we regret to inform you that the Skills4Study module accessible through the Learning Centre module on Blackboard will be unavailable on Saturday 19th and Sunday 20th of January. More information is available about the Skills4Study module and how it can help you with your studies. This workshop is not for you if you think that c/a assignments and mid-term papers are pleasant occasions to display your excellent writing skills. The workshop is for the rest of us humans. We all need to get in shape before the term starts for real. 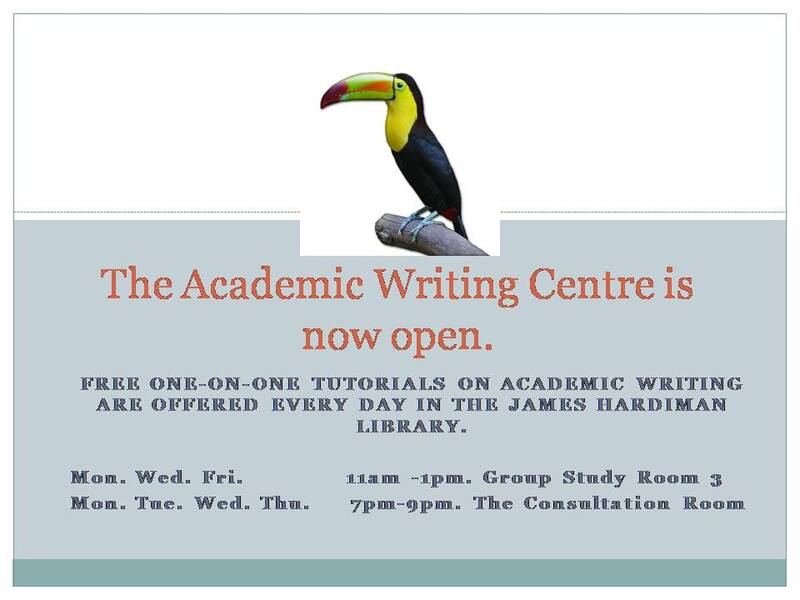 This is an hour-long workshop to address questions on academic writing. We will discuss different approaches to the writing process, common misconceptions, and strategies for improving your writing.